Ever since I made Big Jim some new scuba gear he has refused to put anything else on. This has left his wardrobe and gun cabinet wide open for Barbie. She has been craving the outdoor life for some time now and says she can´t wait to go out on an adventure and live off the land. And I just sat here staring at the screen for hours. Can you help me come up with more appropriate title for this post about Barbie wearing Big Jim´s gear? You did such a awesome job last time and it was so much fun reading all your creative suggestions. The person with the best suggestion gets to choose any print in our shop. Winner will be picked by Isabelle and I on Monday. Charlies Angels? Also, check out the kids book Traction Man by Mimi something. Its about a little boys action figure who goes scuba diving in the kitchen sink. Its really great. Una vann sist. Så många bra ju!! or….all the single ladies..put your hands up! 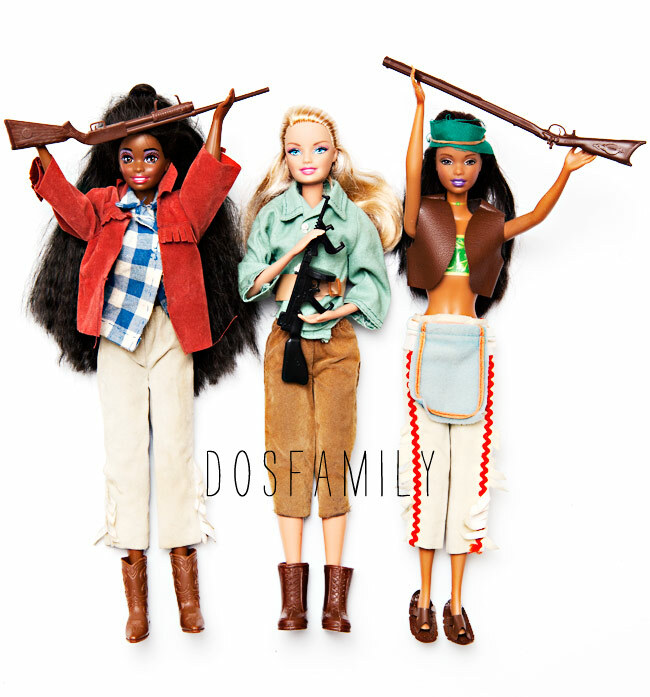 Woodsman Barbie, now with hatchet and rifle accessories. She could also be Hipster Homemaker Barbie or Backwoods Barbie or even Whole Larder Love Barbie. Fun fun. Of course you can! here’s the link =) keep cranking out amazing content guys! love your work! Ja, jag ska ju inte ha något mer förstås… ;) Är så nöjd så nöjd med min “sailor boy” – tack igen! Äsch, kanske inte så kul – men det här inlägget var ju desto kuligare! When do we get to see Big Jim in Barbies outfits? Believe me I have tried. Everything is so damn tight. Nothing fits. There are a few purses that he has borrowed though, but that´s it. I’ll Take It From Here, Jim! Ain’t no sin to dress like Big Jim. I was thinking about the old times, when nickelodeon was still cool and just strated airing in Germany. They had a show called “Action League Now!”- do you know it? This looks like it´s right up my alley , but i have totally missed it. Must see if I can get my paws on it some how. Thank you for the tip!!! !